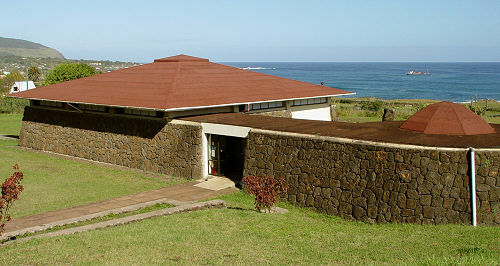 Museo Antropológico Padre Sebastián Englert, located just north of Hanga Roa (exhibits to the left, gift shop to the right). I continued pedaling towards the museum, which was quite a ways north of town and hardly a convenient walk, though it was an easy bike ride. Along the way a friendly dog began trotting alongside me as I pedaled. When I stopped to take a picture, he would stop and wait for me. When I started up again, he immediately broke into a trot to pace me. If I speeded up going down a hill, he would break into a loping run and do the best he could to keep up, but he would usually fall behind. As I leveled off and my speed returned to normal, I would hear him coming up from behind, and he would pull abreast and join me in formation again. When I got to the museum, the dog actually followed me on to the grounds. He would have followed me right into the building, but I made it clear that he wasn't allowed to enter by repeatedly pushing him back and pushing his rump down into a sitting position. Finally he got the message and walked over to some shade and lay down. The museum was quite good though fairly small, with one big room for exhibits and a smaller room for the gift shop. The museum is one building on a campus of buildings, all engaged in the formal archeological study of the island and its ancient culture. All the exhibits signs were in Spanish, but they loaned me a very handy booklet that had excellent English translations for all the exhibit signs, including the captions for each picture. One exhibit described the geologic history of the island, which had major eruptions 3,000,000 years ago, 1,000,000 years ago, and 300,000 years ago. Each major eruption came from a different volcano, leaving the island roughly triangular with a big partially eroded volcano at each corner. They also related Rapa Nui culture to other Polynesian cultures, showing how there were enough similarities to prove that Rapa Nui culture derived directly from other Polynesian cultures. No mention was made of Thor Heyerdahl's now discredited theory that this part of Polynesia was settled by South Americans. 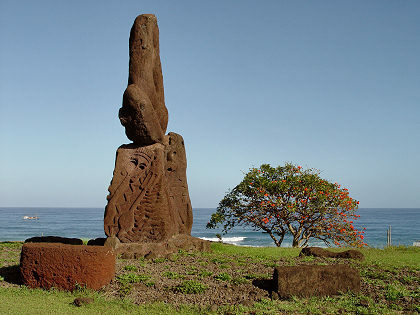 Surprisingly, this island was settled relatively recently, about 400 A.D., and the Birdman culture was even more recent, about 1400 A.D. One reason is that Easter Island is the easternmost island of Polynesia; areas farther west were settled as long as 40,000 years ago. They had some interesting displays of local artifacts, like stone and obsidian tools, fishhooks and harpoon tips, weapons (clubs, lances, throwing stones), and body ornaments (whale teeth, shells, tattoo needles). They had some small stone moai heads and a small female moai (with breasts). They also had a display case with rather hideous-looking woodcarvings of people with big heads and staring eyes and emaciated bodies with all their ribs sticking out (called moai kavakava). Overall the museum was very interesting and well worth the 1,000 pesos. A lot of the information was new to me, information I had not seen elsewhere despite reading guidebooks and doing web research. I checked out the gift shop, which had lots of books and some very nice jewelry, but I wasn't in a shopping mood so I didn't buy anything. There was a small but attractive sculpture garden next to the museum.